I strongly advocate handicrafts! Not just because we are an “arty-crafty” kind of family and love to make gifts, do projects that beautify the home, and create things to trade/ sell. Many gifts and ideas are frugal – making “something out of nothing”. But I have seen the value of a child learning valuable practical skills when they work with their hands. She is in grade 10 and has a lovely business called Captivating Beauty Boutique where she and her dearest friend who lives about an hour and a half away sew and create bridal dresses, bridesmaids and flower girls dresses which they rent for weddings to the workers in the district. They have done 2 weddings already! They did the brides and bridesmaids’ make-up, hair and accessories, transforming these ladies into beautiful women for this special day. 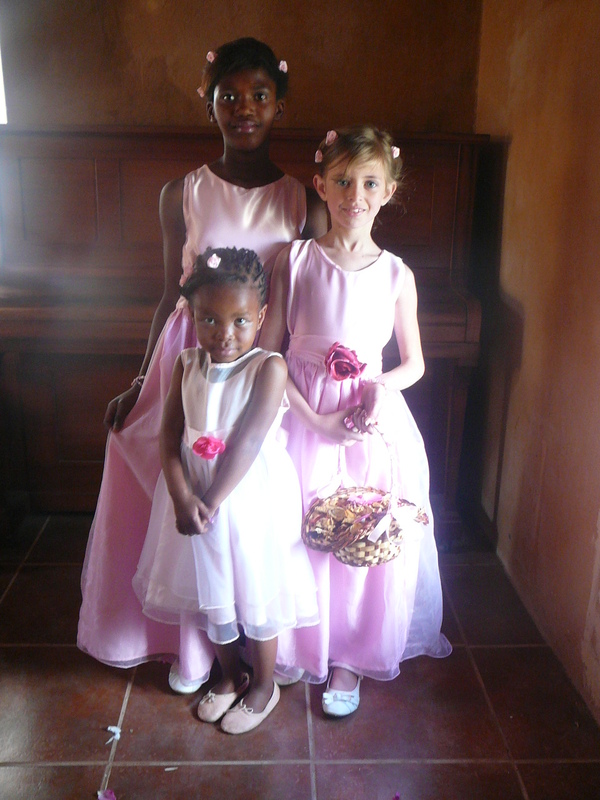 They helped arrange tables and decorate the halls for receptions and created beautiful church flower arrangements. They hosted their first fashion show in July 2010, showcasing their wedding apparel to the local community. Not only did they sew the clothes, they trained and dressed the models, did their hair and make-up and selected jewelry and accessories. They created beautiful flower arrangements and they organized friends and family to help with the music and the lovely tea afterwards. Right now she is hard at work preparing for the next fashion expo for the matric/prom dresses and evening gowns to be held next month. In addition to her handiwork skills, she demonstrates a flair on the computer with graphic art. She designed their business cards, created professional posters for advertising, made stunning invitations and created lovely programs for their expos. In time she will create a fantastic blog too! I have every confidence in her future! She has demonstrated the necessary skills to make and create beautiful garments, work with clients, meet deadlines, organize, prioritize, delegate and assist others in big projects. Once she has completed her schooling she may well rent a gorgeous little Victorian house, convert the front into a vintage tea room and sell dresses from her exquisitely arranged boutique … or she may join a business and be an asset as an employee. This year my younger 2 daughters and I started quilting. Our first project was an appliquéd and quilted hearts for gifts/ decoration. The second quilt project is still in progress. We are sewing a set of appliquéd quilted squares to hang in the dairy area of our kitchen. My youngest (9) still needs to finish stitching the binding and my 11-year-old needs to complete the tabs and press her quilt square – quite a lovely simple project! 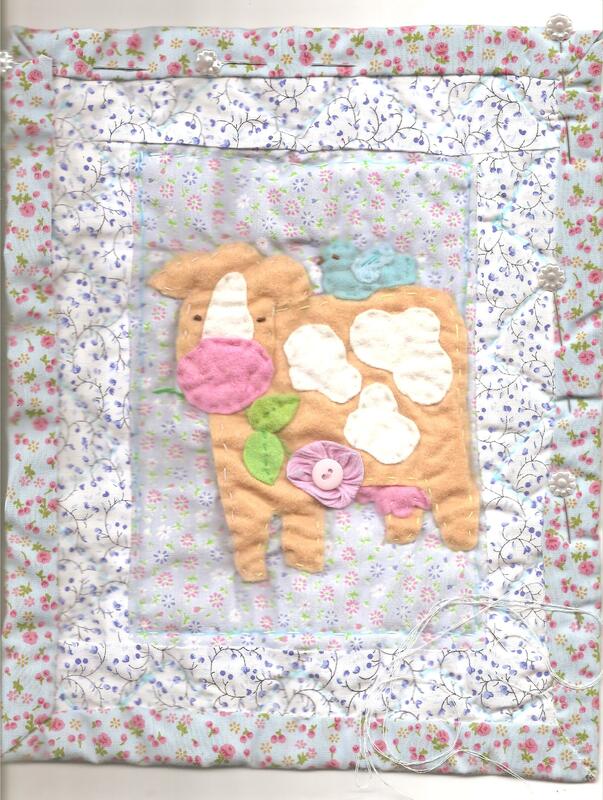 I can’t wait to hang these mini quilts on a dowel stick and enjoy seeing their handiwork everyday when we strain and store milk and make our dairy products. What skills can your children learn? A child is equipped when she learns practical skills. A child may discover a gift or talent when they learn a craft. Their self-image is boosted when they are able, useful and can say “I can”. I hope your projects and handicraft activities bring you and family great joy! This post has been submitted to the upcoming Charlotte Mason Blog Carnival. ← A New Carnival for South African Homeschoolers! I have been machine quilting for years but have not begun to sew apparel yet. I am wanting to learn and teach my daughter too. So the question is ‘how should I go about learning?’. Should I enroll in a class, buy a book, read a blog? How would you(or your daughter) suggest I go about this? Thanks! BTW, love the post! @Vicky, can I say “yes” to all 3 suggestions? I found basic lessons in needlework books, and we read a few tutorials on the web. wow, Nadine I love what your daughter oldest daughter is doing! Beautiful! Beautiful dresses! I’m so impressed! I agree with Charlotte Mason about the usefulness of the effort. My daughter wants to learn to sew, and I’ve begun thinking about how to work that in. Very, very impressive! (Your daughter’s work.) I’ve been very crafty lately. When Sprite came home from camp, she caught the bug and asked for help on a new sewing project. I think that the ability to sew is a great homemaking skill. Love the dresses!! Fabulous that your daughter and her friend are already doing such good work, and doing something fantastic with it! Great list you have, too, of all other sorts of handicrafts to do. Beautiful dresses! Your daughter is very talented; using her gifts and your instruction fruitfully. Thank you for sharing it! Thank you for this post. I think often we place soooo much emphasis on academic work that handicrafts and practical skills can be dismissed as second best. I firmly believe that both are an essential part of a well balanced education and a well balanced life, for that matter. Your daughter is very talented and clearly putting her gifts to great use! I am impressed! Those dresses are just lovely! And i’m inspired to start incorporating handicrafts more into our everyday life…. this is a lovely list of handicrafts. thanks for sharing about your oldest daughter’s creativity as well-my little girl has a creative flair as well and has said she’d like to be a designer of clothes one day (amongst other things) so it was lovely to read about your daughter’s experience. So inspiring! In South Africa today, I think giving your child the skills to run their own business from an early age is an awesome gift! I’m new to homeschooling, but I hope that I can invest that much in my son. i bet you are a super proud mama! i feel proud of her and i don’t even know her! heheh. ps. thanks for submitting this to the cm blog carnival!